Happy Old Rock Day. I picked the granite at the Devonian Gardens to sketch this morning. 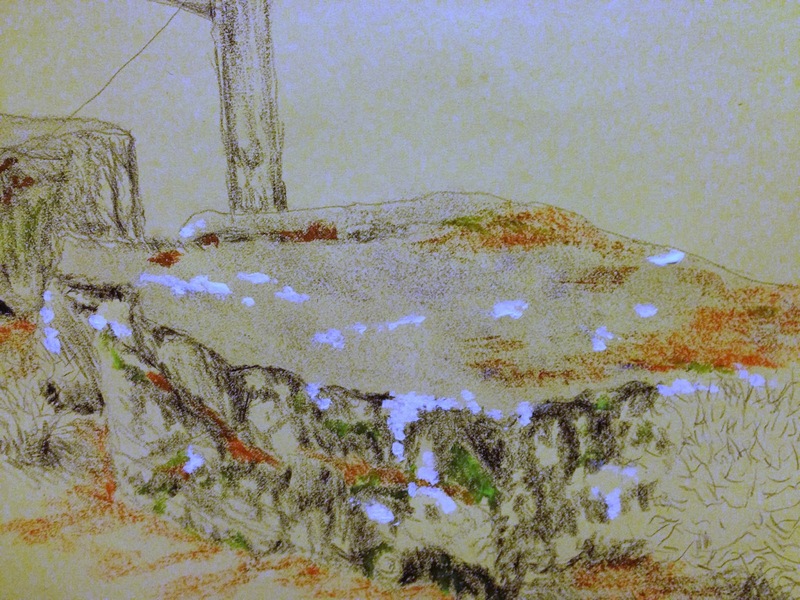 The challenge of sketching rocks used to confound me. Their irregular shapes and shadows are deceptively simple, but difficult to get just right. But get in to the rock, and I get a sense of what it is. Which I suspect Japanese gardeners have known for a lot longer than I have. Rocks represent immense age and experience. Age and experience is something I do hope this society learns to revere, before we bury it. Rocks just sit there, so it is easy to pass them by. They don't charm, entertain, or amuse like a lively pet. The rock has no need of us, so it's message is a whisper in the fountain of life. One must take time to sit and listen. First I am impressed with how massive it is, and how life has settled in to it's nooks and crannies. There's a heavy fall of orange pine needles, and several lichens; green, grey, and white, creep across it's surface. How long does it take an inch of soil to form on the surface of bare rock? Five hundred years! Imagine how many years drift by on our prairie winds. Underneath the lichens is the rock itself, heavily striated. The surface is nearly uniformly smooth; hostile to new life. The edges, roughed out but still showing the striations of it's early development. How many years do those lines represent? Impossibly older than I will ever be. I am in the presence of a thing that has outlasted me, and will endure well beyond my spark. The framing plants are tightly pruned, their winter twigs forming dense globes on either side of the granit. All things are for a reason in a Japanese garden, so I wonder. 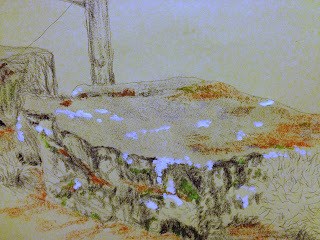 The rock was in charcoal, but I could not dismiss it's dressings, so out came pastels and chalk for the orange and green, and finally white acrylic for the brightest lichens.